Lurline's Place: Avalon Homestead Retreat! Back home again! Oh, what a wonderful few few days we have had - just 12 of us this time and it was so lovely the interaction between us all - what a great way to really get to know each other! 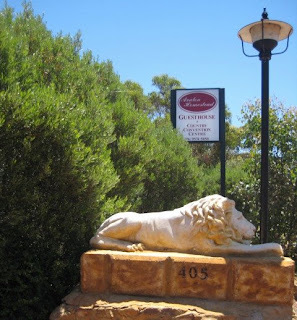 We met for lunch at the Toodyay Victoria Hotel - a lovely old country pub! 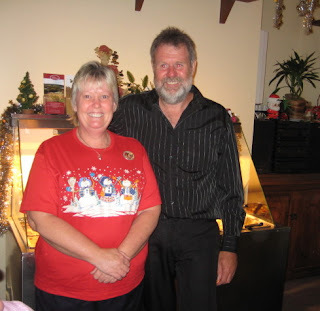 Then off to the Homestead where we were once again welcomed by Delveen and Peter - here they are last year coming up Christmas, but they still spoil us with the greatest hospitality! 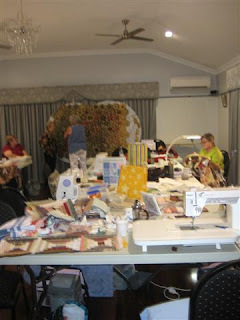 This will be a familiar sight to all who have been on a retreat - a beautiful Convention Room with gorgeous drapes, a lovely modern day chandelier, wonderful lighting and gorgeous polished jarrah wood floors - and then, look at the mess only quilters can make! Below, this Little Black Duck wasn't over-productive I'm afraid - some hand-quilting done on my Angel Quilt and then a little trial run on a lace border I may put on the finished quilt! Now, lots of pics with lot of variety! Raelene was a great achiever, in progress a Thirties Dresden Plate! Raelene again - a log cabin achieving a wonderful antique look - I just love this! A pretty little Thirties Dresden Plate - in an Ikea frame - great idea! Now - Janet with her colour-wash, mind boggling, I thought - but what a wonderful outcome! Marilyn, with another mind boggler - it was funny, the Girls sat there with ' move this one here, move that one there' - I failed to be drawn into it - too much for me! Dear friend, Teena's Trip around the World - Teena was my travelling buddy, I was designated driver this time! My other travelling buddy, Kris - we also roomed together - great girlfriends, we are, having travelled the USA together in 2007! 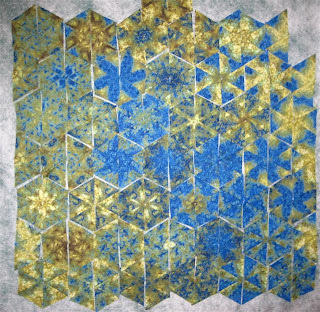 Here is her wonderful Hexagon and Stars being beautifully hand-quilted with the tiniest of stitches - Kris uses the spoon method! 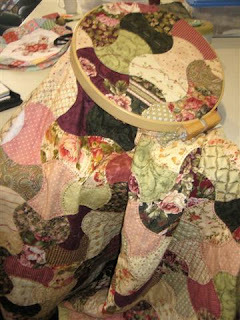 Irene is in the throes of Perle thread hand-quilting using larger stitches, this gorgeous Apple Core Quilt! Look at the gorgeous enhancement that is happening! Barb once again organized the retreat for us - so well done, thanks Barb! 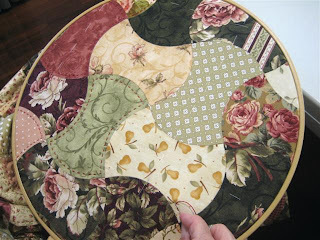 This gorgeous project below uses Thirties fabrics and American Hand-piecing! 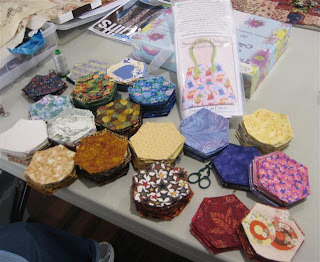 Diane worked for part of the time on preparing Hexagons of Hope (see my sidebar) - so very generous of her to donate so much of her time - she has made literally hundreds! Dear friend Louise almost finished a lovely bag - I will show you one day - she remained relatively controlled with the stress the pattern caused! 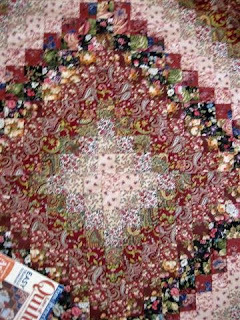 Her dear friend, Nancy worked on her hardanger that I have shown you recently! Wow, Canadians on each side of me - they have both been in Australia for years and I am still trying to teach them to speak Australian - not an easy task, I tell you! Well, it's back to reality now - a little sad it's over - but thanks to all the great folk who contributed to a wonderful Retreat! 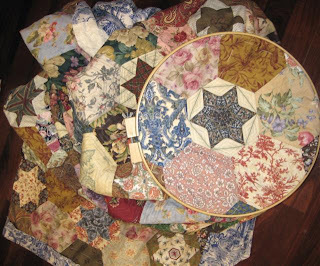 Thanks for sharing all the lovely quilt projects. Oh what a fun time you must of had, I love all that you showed, love the block in a frame, what a great idea. Nice to have you back! You sound positively energised! Loved the show and tell. Looks like you all had a wonderful time- the quilts are beautiful! Looks like you had a great time. 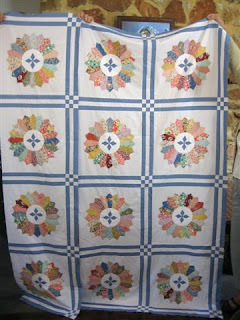 Those two colour wash quilts are amazing aren't they. Very arty, something I would hang in a wall. Lurline...looks like you guys had the best time...lots of nice show and tell there, glad you are home safe and sound..
Great pictures, love the quilts! So glad you had a wonderful time! Fabulous pictures!! What a treat to see all those glorious quilts. Glad you had a good time! I'm glad you had such a good time. My favourite is the courthouse steps quilt, followed by the dresden plate. I'm very traditional I guess. Thanks for show and tell. Thanks for all the fabulous show and tell Lurline. It looks like you had a wonderful time - isn't it a treat to spend time with good friends :o). Hi, good to see your home safe...have missed you! 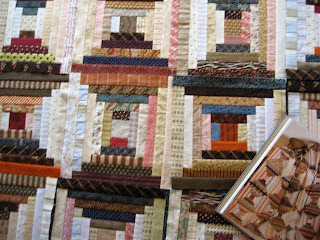 oh I wish I could have been there and seen these quilts for myself!!! I am going to make one of those too, soon! How fun!!! 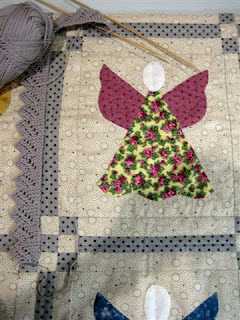 I love the lace edge you're putting on your angel quilt. I can't wait to see that one finished. 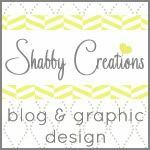 Undeniably the best way to start a blogging session. I'm so excited to sit here and absorb your gift of "shares" with coffee and peace. The lace edging looks lovely. I cannot tell you how much I hope that works out. Everything... Oh I'll be back just to study, soak it in and relax. Welcome home! *karendianne. Such great pictures...love to see everyone's creations. Glad you had a wonderful time! Such wonderful projects. Very inspiring. Those are some amazing projects. Sounds like a wonderful time. I wish I could have tagged along! Looked like alot of fun. Thanks for all the photos. Looks like everyone had a wonderful time. It's so great to see photo of everyone's work. Lurline, was that a knitted "lace" border you were doing? Now I can knit but I can't crochet. Is it difficult to do, the knitted lace I'm referring to. It looks awesome! Happy you made it home safe and sound. 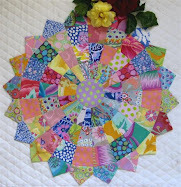 Glad you had such a wonderful time at6 the retreat and thanks for sharing the pics of the wonderful quilts. I have a retreat in three weeks in Belfast, so i am really looking forward to it. Lurline - I have never ever been #26 to comment on your blog! My internet, phone and tv have been out for 2 days! I am glad to be catching up and thrilled to see all your pictures of such beautiful treasures. So happy you enjoyed the trip - it sounds like so much fun. Enjoy your weekend, my treasured friend. Oh what fun!!! 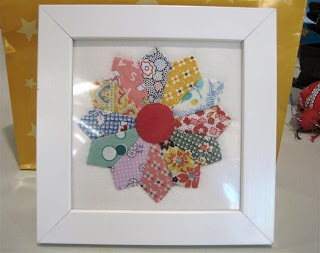 Great photos of wonderful 'quilty goodness'!! Just found your blog. Great photos. 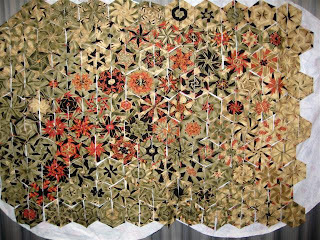 I really love the apple core quilt. I am just about to start one of those so it was great to see one almost complete. So much talent at your retreat - thank you so much for sharing. What talented friends you have Lurline! 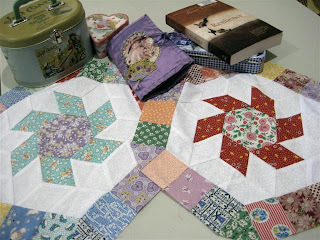 I love all these projects especially the log cabin and hexagon with stars.